With a new year come new trends. This past year we saw so many hair trends come and go, but none stuck out as much as the silver hair trend. I’ve conducted some research into what new hair trends we can expect in 2018 and aside from using them for my own hair transformation I had to share them with you! What can we expect in hair colour trends for 2018? Let’s have a look! The grey hair trend isn’t going anywhere! It seems that either on social media or with my circle of friends someone is always taking on the challenge of getting their hair to this covetable state. One of my friends is currently in the process of getting her hair light enough to get it dyed grey, sadly it won’t be as simple as she thought since the only way she can prevent her hair from getting damaged is to take it slow and follow her hairdresser’s timeline of a couple of months. I have always been in love with all shades of red. Copper is one of my favourite looks and yet another one that isn’t that simple to achieve. My hair naturally has a tinge of red, I suppose it’s from all of the lightenings throughout the years, but it never gets exactly how I want it to look. With so many shades of this hair colour in style, I don’t know which one I would go for. What I do know is that I won’t be the only one looking for this shade in 2018! The 2017 hair trend of bright and bold hair colours is set to bleed into the new year. Bright and bold seems to be going strong and lots of us will probably want to keep up with the trend. From greens to blues to reds to every other shade that you can think of unnatural hair colours have been all the rage and by the looks of it will continue to be well into 2018. We can thank the soon to be royal for the spike in the rich dark and natural hair trend. With a head of shiny hair, Meghan Markle’s hair is definitely one to envy whether you’re a fan of the former Hollywood actress or not. The rich and dark shade looks natural and classy and will surely spike in popularity as her popularity rises. I don’t know about you but I love changing my hair colour and am eager to try each of these trends next year. Instead of damaging my hair I think I’ll probably opt for alternative ways to change up my hair. Lace front wigs are a good way to change up your hair without committing to any shade for too long. 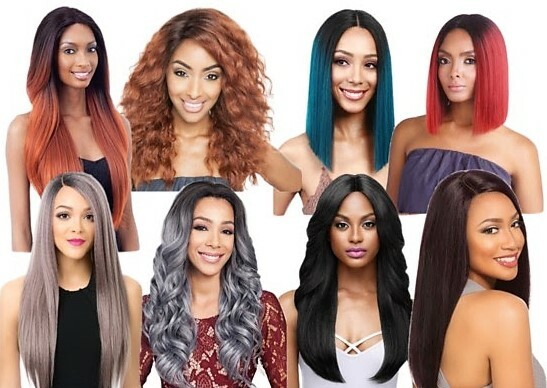 Divatress is a great online shop that offers a great variety of options not only in hair care but also when it comes to beautiful wigs for any look. I really like that their wigs vary in length and colours and are the perfect option to suit many occasions. In an effort to take care of my hair I will definitely be looking forward to getting myself a gorgeous lace front wig!